Ask Jacoba what he likes best, and the answer is “school.” Indeed, Jacob looks like any other 5-year-old going off to kindergarten—but his school is a little different. The Bruce/WoodGreen Early Learning Centre at Bruce Jr. Public School in east Toronto is designed to show how good public policy can aff ect good on-the-ground practice. Unlike his counterparts attending kindergarten in nearby schools, Jacob attends a program that combines kindergarten and child care. His is a seamless day packed with music, stories, reading and math games, craft s and outdoor play, all fuelled by a hot lunch and tasty snacks. Meanwhile, his mother, Magela, is down the hall in a colourful room fi lled with adult-sized easy chairs and children’s play centres. Jacob’s classroom doesn’t look much different from a traditional kindergarten or child care setting, but behind the scenes a great deal more is happening. Teachers, early childhood educators, educational assistants and parenting staff work as a team to create a learning environment incorporating the best traditions of kindergarten, early childhood education and family supports. 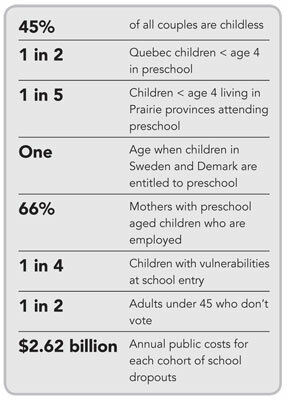 Children do not bounce from child care to kindergarten and back again; instead, they spend their day in a consistent environment, with the same adults, all with the same expectations. Parents leave for work feeling secure about their child’s well-being, spend time in their child’s class or drop into the family centre to spend time with their baby and to catch up with other parents and caregivers. Magela’s children are among several thousand who have taken part in Toronto First Duty, a project designed to combine the three service silos— regulated child care, kindergarten and parenting supports—into a single, accessible early childhood program. The goal is to respond simultaneously to two pressing social needs: giving children the smart start they need for school and for life, while at the same time supporting parents while they work, pursue their own education or take care of other family members. The project’s initial focus was on children attending junior and senior kindergarten. In response to family needs, it now includes younger children and provides full-day, year-round programming for school-age children as well. Since its inception in 2000, Toronto First Duty has inspired similar experiments in communities from Atlantic Canada to British Columbia, and in places as far away as Australia. Visitors to the school often remark, “I wish we could afford this.” They are told: “You can. We receive no more resources than any other school in the community. We just use them differently.” From a financial viewpoint, this is the beauty of the integrated early childhood program; instead of fragmented administrative and funding structures vying, and often paying twice, for the same children and families, the program combines staff, facilities, equipment, supplies and administration to create a financially-efficient program where parents want to send their children. a Actual interview. Names changed for privacy.